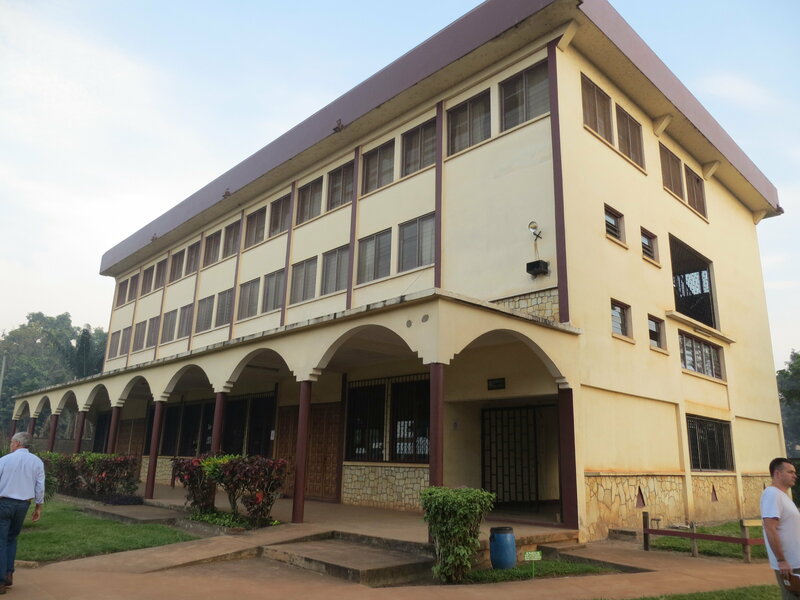 The Bangui Evangelical School of Theology (FATEB) has been training men and women for Christian service in French Africa for the past 40 years, and FATEB’s president, Dr. Nupanga, felt it was time to celebrate. So, invitations were sent to graduates, overseas partners, local churches, friends, and officials of the Central African government. The special activities took place the last week of January, beginning with a two and a half day conference on the role of the Church in African countries that are experiencing, or recovering from, violent conflict. Several excellent presentations and discussions developed this sobering theme. The last two days of the week were devoted to celebration. People recounted memories of how FATEB had impacted their lives and ministries, and I shared information about FATEB’s early days. The Association of Evangelicals in Africa (AEA) voted in 1973 to establish FATEB, and its Board Chairman and General Secretary joined the celebration. On the final morning we prepared to welcome President Touadera, the Chief of State. To our surprise, the President arrived on campus with his Prime Minister, some of his Cabinet, the Vice President of the General Assembly, a color guard, a military honor guard, and other government officials. As an expression of thanks to people who have served the country in outstanding ways, the President made Dr. Nupanga an honorary Commander in the Central African Republic and knighted several other FATEB related individuals. In the President’s informal remarks to the several hundred people in attendance he paid special tribute to FATEB for sheltering several thousand internally displaced people over the past 4 years. He also thanked FATEB for the many pre-school, elementary and secondary school aged children from the capital that FATEB has educated in its Christian schools. These schools rate among the best in the city and currently enroll 2,400 children and youth who come daily to the campus to study. After the special events of the week I remarked to Dr. Nupanga that it felt like more was being celebrated than just FATEB’s 40 year history. He said, “Yes, the people were also celebrating the hopeful beginning of a new era of growing peace and stability following the past 4 years of trauma.” There remain tremendous challenges for this new government that has been in power just under a year. But the economic activity has never seemed stronger, and we felt a spirit of hope and optimism everywhere. The visits of partners from other countries for the celebration also helped the faculty and staff to realize that they had not been forgotten during the years of conflict. We saw other signs of progress on campus. Three construction projects to expand physical space and educational opportunity have begun. The last of the internally displaced people of Bangui left campus just this week. An American team from Mtelo Ministries is doing two months of volunteer work to upgrade the older buildings of FATEB. We were deeply touched by the stories of danger and courage we heard. The wife of a Central African Army chaplain, she and he both FATEB graduates, was forced to open the door of her home one night to rebel soldiers. They were looking to kill anyone in the Central African Army. As her husband escaped through a back window, and while the soldiers searched the house, she stood with her children, praying that her husband would not be found and that she would not be assaulted. The rebel leader asked where her husband was and demanded money. She replied that her husband was out and that she had no money, both true statements. The rebel leader, eventually convinced she was telling the truth, left the house with his comrades without violating anyone in the family. Today, this woman and her chaplain husband, though still marked by memories of the trauma, are living lives of devoted service to others. We have been watching FATEB from its founding in the 1970s by forward-looking Africans. Its service to French Africa through the equipping of leaders for Church and society seems remarkable to us. There was no guarantee that this project would be as successful as it has proven to be. The Board and administration testify to the providence and faithfulness of God that have protected and blessed this institution. Our lives have been greatly enriched by the students we have known and the colleagues with whom we have worked. Our hope and prayer is that FATEB’s next 40 years will be as faithful and fruitful as the past 40 have been. Dr. Jack Robinson and his wife, Theo, have been serving FATEB since 1983 as missionaries under WorldVenture, a network of people connected in the common cause of seeing the Great Commission fulfilled.